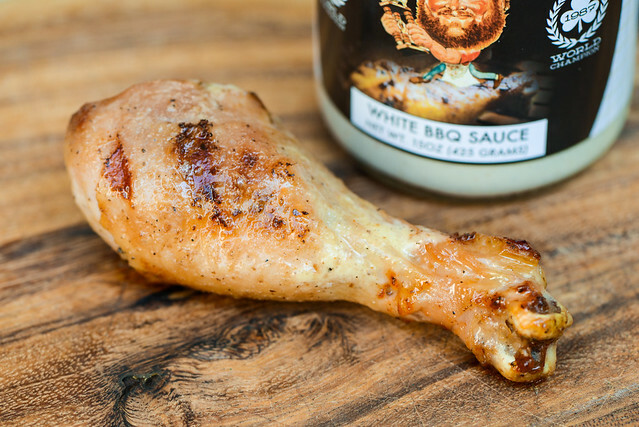 A white sauce with bite, Jim Quessenberry's White BBQ Sauce employs horseradish and additional pepper to make it stand apart in a good way. This bottle of sauce came as part of a housewarming basket sent to me by Peter Grumbles of Bluff City BBQ Supply out of Memphis, TN. The company was formed in 2014 to bring quality barbecue supplies to the Memphis area in one place. Peter works with three others on the business, two of those being Michael & Lee Quessenberry, sons of Jim Quessenberry—two time Irish Cup International Barbecue Contest champion and pitmaster of the Arkansas-based Trav'ler competition team. They brought along their father's original sauce and seem to be expanding into new territory with this Alabama white sauce. 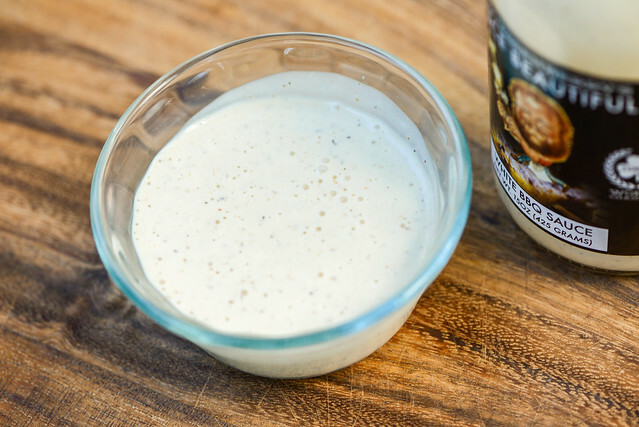 A super tangy mayo spiked with horseradish is the the first aroma that hits you with this sauce. When you smell a little deeper, there's a lemony tilt that sits behind the more dominant vinegar. There's also a discernible black pepper kick. Absent altogether is any type of sweetness. This off-white sauce has the appearance of exactly what it is—thinned out mayo. It's medium-thin and pours very quickly in a steady stream off a suspended spoon at the start. The sauce then slows to a few final drips and leaves a thin, opaque coating left clinging to the spoon. In this coating you can see the plethora of black and red pepper specs that are suspended in the sauce. I've never had a sauce remind me of Jewish holiday before, but the upfront horseradish in this white sauce instantly invoked memories of the Passover seder, where that strong bite of this root vegetable is a central part of the meal. Behind the power of the horseradish is the mayo base, which gives the sauce a creamy texture and mild tang. In only takes about a second for that mellow tang to transform into a more intense tartness by way of vinegar with a lemony undertone. The sourness continues to build the entire time the sauce sits on the tongue, and right before it leaves, a very distinct black pepper bite comes out with an amped up heat from cayenne. This leaves the aftertaste with mellow burn from three different heats backed up by a strong tang. This sauce coated the chicken in a very thing, even layer. Because of its color, it was hard to tell if it was baking in or burning off over indirect heat since the leg remained pretty pale. As I expected, there was no burning or caramelization over direct heat due to the lack of sugar, and the only color the chicken picked up was the sear delivered by contact with the grill's grates. While it was hard to tell if the sauce was doing its job by looks, in the flavor, the results were clear. The chicken had an enhanced richness as well as a mellow bite of horseradish, which remained present, but was less pronounced than out of the jar. There was a slight citrus flavor as well along with an very mild heat. White sauces are meant to two one thing really well—make chicken better. I've explored this both with Alabama and Cornell chicken recipes in the past, and found that a vinegar laden mayo really adds a richness and tang to chicken that enhances, rather than alters, the natural flavor of the meat. 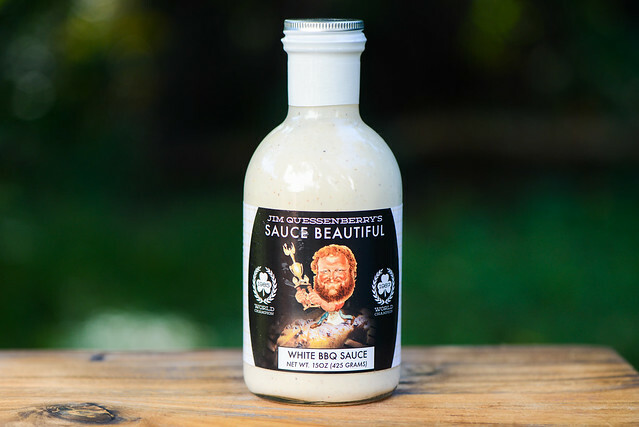 Jim Quessenberry's Sauce Beautiful White BBQ Sauce continues this tradition and does it outstandingly with its full flavor profile that comes by way of horseradish, lemon, and peppers. It was my favorite white sauce I've had to date and would recommend it to anyone wanting to try out why it goes so well with chicken. Besides its use on the grill, I would imagine this would also be a fine addition to a chicken or potato salad as well. While I used up all my Jim Quessenberry's sauces on reviews, I was sent a couple different seasonings I'd like to give away to you awesome Meatwavers. All you have to do to win a can of Jim Quessenberry's Rub Beautiful and Jim Quessenberry's Steak Beautiful is to leave a comment on this post on what your favorite item is to grill or smoke for the holidays. Deadline for entries is 11:59pm on Tuesday December 8, 2015. Read the official rules for more details. One entry only per individual. Good luck! It used to be a prime rib on the rotisserie, but the last couple of years it has been loukaniko on the smoker than the grill. This year I hope to incorporate some of your tips into my recipe. Thanksgiving Smoked Turkey on the BGE. I love smoking a Cajun butter injected turkey breasts on my Masterbilt smoker. We celebrate the New Year with grilled Beef Tenderloin and Lobster. I like to grill pork chops.